Let’s just say Philadelphia’s got talent. It was announced this week that Philadelphia’s Gabriel Quinn Bauriedel, Dan Rothenberg, and Dito van Reigersberg of Pig Iron Theatre Company and furniture designer Matthias Pliessnig were named USA Knight Fellows at a celebration at Jazz at Lincoln Center in New York City. The Pig Iron collaborative and Pliessnig will each receive an unrestricted $50,000 grant from United States Artists (USA), part of a $1 million grant from the John S. and James L. Knight Foundation to USA, a national grant-making and advocacy organization. Last year, Philadelphia ceramicist Kukuli Velarde was named one of the first USA Knight Fellows. For her community engagement project, Velarde and her husband (whom she met while both were residents at the Clay Studio, 13 years ago) established a ceramic studio in the basement of the West Kensington Ministry.The studio began offering classes this summer. Check out local filmmaker David S. Kessler’s Studioscopic portrait of Kukuli from a few years back below to learn more about her work. Inspired by boatbuilding techniques and classic modernist furniture, Matthias Pliessnig has made a name for himself with his visually stunning pieces constructed primarily with steamed bent-wood strips. 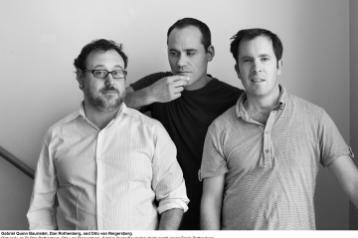 Gabriel Quinn Bauriedel, Dan Rothenberg, and Dito van Reigersberg, co-artistic directors of Pig Iron Theatre Company, create performance works that defy easy categorization. Find out more about Canary’s work with the Knight Foundation, including our campaign for the three-year, $9 million initiative Knight Arts Challenge Philadelphia, right here at canarypromo.com/work/knightarts. Finalists for the first year of the Philadelphia contest will be announced in early 2011. Stay tuned.